NIDA-supported research has found that methamphetamine abusers typically use the drug throughout the day in a pattern that resembles taking medication, while cocaine abusers often exhibit a binge pattern, using the drug continuously over a period of several evening and nighttime hours. And, according to the researchers at the University of California, Los Angeles (UCLA), the drugs appear to cause different types of deficits in reasoning and concentration. Dr. Sara Simon and her UCLA colleagues interviewed 120 methamphetamine abusers and 63 cocaine abusers to determine patterns of drug use. Ninety-seven of the methamphetamine abusers and 56 cocaine abusers were recruited from treatment programs; the others were currently using the drug and not seeking treatment. Continuous use-more than 20 times per month-was more common for both cocaine abusers (52 percent) and methamphetamine abusers (70 percent) than was any other pattern of drug use. Among those who used either drug fewer than 20 times per month, methamphetamine abusers were 4 times as likely as cocaine abusers (48 percent compared with 12 percent) to use the drug at least once per week in a regular cycle. "The typical methamphetamine abuser reported using the drug when he or she first got up in the morning, then using approximately every 2 to 4 hours during their waking day. Most of the descriptions of use more closely resembled taking a medication than using a drug for pleasure," Dr. Simon says. "Cocaine abusers reported patterns that fit a picture of recreational use: They began in the evening and continued until all the cocaine on hand had been used." The different patterns of use may in part be a result of the drugs’ different effects in the body, the researchers say: Methamphetamine triggers the release of large amounts of the neurotransmitter dopamine into areas of the brain that regulate feelings of pleasure, whereas cocaine blocks the removal of dopamine, resulting in an accumulation that causes continuous pleasurable stimulation of brain cells. The effects of methamphetamine typically last more than 10 hours, and the half-life (the time it takes for the body to remove 50 percent of the drug) of methamphetamine is 12 hours. Cocaine’s half-life is roughly 1 hour, and the drug’s high lasts about 20 to 30 minutes. Understanding the patterns of use for methamphetamine and cocaine will help treatment providers and drug users identify circumstances that may lead to relapse to drug use. "Differences in use patterns indicate different triggers and different times and places when the recovering abuser is particularly vulnerable," says Dr. Simon. In another study, Dr. Simon and her colleagues evaluated the effects of methamphetamine and cocaine on learning and memory in 40 methamphetamine abusers and 40 cocaine abusers who were not in treatment and 80 individuals who had never used either stimulant drug. The researchers administered tests to evaluate memory, perceptual speed and ability to manipulate information, ability to ignore irrelevant information, general intelligence, verbal fluency, and executive function (abstract reasoning, reactive flexibility, and ability to use feedback). Methamphetamine abusers performed more poorly than nonusers of stimulants in tests of word recall, perceptual speed, ability to manipulate information, and abstract thinking. Cocaine abusers scored more poorly than nonusers of stimulants in tests measuring ability to recall words and pictures and working memory. "Methamphetamine abusers displayed impairments on the tests of perceptual speed and manipulation of information that were not seen in the cocaine group. Moreover, in tests that require both speed and manipulation, there was even more difference between the groups than on tests of either skill separately," Dr. Simon says. "Overall, both drugs are associated with similar cognitive deficits," Dr. Simon says. "The most striking difference is that methamphetamine abusers have more trouble than cocaine abusers at tasks requiring attention and the ability to organize information." Simon, S.L., et al. 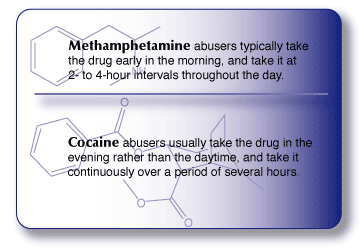 A comparison of patterns of methamphetamine and cocaine use. Journal of Addictive Diseases, in press. Simon, S.L., et al. Cognitive performance of current methamphetamine and cocaine users. Journal of Addictive Diseases, in press.